Bolt is a critical part of rifle that without it shooting does not occur. Bolt is assembled in to another part called Bolt Carrier and is put in the rifle in the back, just ahead of Cocking Handle. 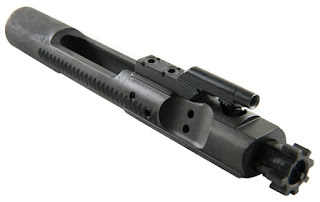 Bolt practically moves a round to the Chamber when it comes up from magazine. During the training in CFLRS, and I hope this is not a secret, when the recruits are assigned a rifle, the bolt is taken out, for safety reasons and is put in only during drill practice (to make it heavier!) and shooting. When the bolts are platoon members are out, they are all put in a box and a recruit is assigned to carry the box everywhere the platoon goes. I was in charge of one of the damn boxes which had more than 33 damn bolts and it was freaking heavy! And when I say heavy, I really mean it. I don't exaggerate. The staff usually would let me go ahead of the platoon because I was way slower than the rest. The other box, in our platoon, which was remarkably smaller than usual at the beginning, had only few bolt. The other guy didn't have much trouble but usually there are two guys who chase the platoon while hauling the damn boxes! I wondered how heavy the damn box was and I was going to measure a bolt, consider the hallow parts of it's cylinder shape, calculate it's volume and using the density formula which is Density = Mass/Volume but I never got the chance! The act of putting in or pulling out the Bolt as usual and similar to everything else(!) in CFLRS should take place fast. However there's a time that the Bolt Carrier, which is casually is called Bolt, should be put with much attention and that's when the rifle is stripped (or disassembled) and is now is going to be re-assembled. There're are two tests to be performed before the Bolt can go back in: The first one is hitting the bolt on your palm to make sure that its components are not loose because if they give away when they are in the rifle, there will be a disaster to take them out. The second test which is not actually a test and is an extra step before the Bolt can go in, is to shake it well, downward in a way that rectangle-shape bolt is turned to its proper direction. The last thing to mention about this piece is one of the reasons why the Bolts are taken away from recruits which deprives them from a good practice on daily basis when they have the rifle in their possession. Apparently there has been a number of shooting previously in the school or other Canadian bases. A member went bananas and opened fire on people. They intent to prevent that in case someone got live rounds similar to Lowrance (Private Pyle) in Full Metal Jacket and kills someone!